Supernatural airs tonight on the CW with an all new Thursday, November 3, season 12 episode 4 called “Amercian Nightmare,” and we have your Supernatural recap below. On tonight’s Supernatural episode, Dean (Jensen Ackles) struggles to accept Mary’s (Samantha Smith) latest decision. Did you watch the Supernatural season 12 episode 3 where when a crying baby led to death in a mysterious abandoned house, Mary (guest star Samantha Smith), Sam (Jared Padelicki) and Dean (Jensen Ackles) decided to investigate? If you missed the episode we have a full and detailed Supernatural recap, right here for you! 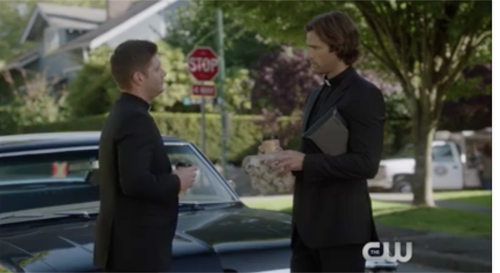 On tonight’s Supernatural episode as per the CW synopsis, “Sam (Jared Padalecki) and Dean (Jensen Ackles) investigate a case that leads them to a devout religious family that lives off the grid. The brothers realize that the parents are hiding a huge secret that could destroy them all. Meanwhile, Dean struggles to accept Mary’s (guest star Samantha Smith) latest decision. Tonight’s season 12 Supernatural episode looks like it is going to be great and you won’t want to miss it, so be sure to tune in for our Supernatural recap between 9PM – 10PM ET! While you wait for the recap make sure to check out all our Supernatural recaps, news, spoilers & more, right here! A young woman apparently being flayed alive had tried going to church on tonight’s episode of “Supernatural” for help however the priest there didn’t exactly know what to do. At least not for something that he had only suspected could happen and never in his wild dreams believed could actually happen. So Olivia Sanchez unfortunately, died from her wounds and no one knew what she had died from. But Sam and Dean had their suspicions. The boys later showed up in town dressed as priests and they tried getting everything they could from the church and what they found out hadn’t been much. The priest that had seen Olivia’s suffering had said that she was speaking in tongues and so that helped the boys, but the priest hadn’t known what affected Olivia and he neither smelled nor saw any signs of sulfur. Yet, he did remember what Olivia said and so Sam later translated the victim’s last words. Olivia it seems had been talking in Aramaic and what she said had more or less been a plea for help. So the boys ended up getting better help at the coroner’s office where they showed up dressed as the feds. The feds as it happens could demand Olivia’s autopsy and to be left alone with the body. So the boys did find out a few things down at the coroner’s office. They found out that Olivia’s brain had been turned into “goopy mush” and there hadn’t been much else off about the autopsy besides her flayed back yet there later was a second victim that proved Olivia’s death hadn’t been a one-off. The second victim had been a young man that was seeming working as a grocery clerk and there hadn’t been any evidence that he had been some evil guy. Though Olivia for that matter hadn’t done anything either. She had just been working for Child Protective Services and therefore seeing that children had the best care. However, someone had a problem with the two and their only connection had been the Petersons. The Petersons were deeply religious family whose daughter had gotten sick not that long ago and they had refused to take her to the doctors. So the daughter died and they simply became more insular. What they didn’t grow themselves, the delivery boy from the grocery store got for them. The family though was considered to be a longshot by Dean. Dean felt that Olivia’s co-worker who now has her old office was a good suspect and so he refused to see that there was something off about the Petersons. Dean had found out that the coworker was a Wiccan and so that had made her more or less a witch in his eyes. But Sam on the other hand, did suspect the Petersons. He thought the mother’s story about turning away from technology and modern life because she had been a pill addict and her husband had spent too much time at the office a poor excuse for why they had let their daughter die. So eventually Sam and Dean did reach an impasse. They each had their own suspects and neither was willing to back down so they went their separate ways. The boys split up to see who really caused Olivia and the grocery boy’s death. Dean had gone back into town to check out Beth, but Sam had stayed at the Peterson farm and he did find something before his brother. Sam had found out that the daughter that allegedly died from pneumonia was still alive. Magda was apparently being kept in the basement under lock and key and the young woman repeatedly had to flay herself as she repeated the same Aramaic passage that Olivia had been saying at her death. So Sam quickly realized that he had been right about the Petersons and that they had been the ones behind the two recent murders. Though his call to his brother had gotten interrupted. Sam had called Dean and he had gotten the chance to tell him that Magda was still alive though he had been found before he could say anything else. Magda as it turns out had been kept prisoner by her whole family that believed she had the devil inside of her and so they knocked out Dean once they realize that he had saw too much. Yet, Dean didn’t need any prodding to go after his brother because he had heard enough to know that Sam was in trouble. So help was on the way while Sam was trying to figure out what was going on. And what Sam found out was that Magda was psychic. Magda could hear people’s thoughts and she could move things with her mind. So once Magda started to do those things, her family had moved away and had tried to keep everyone away as well yet nothing they did kept Magda from seeing people. Like when she saw the social worker come by. Magda had thought that someone as nice as Olivia could help and so she tried to get Olivia to hear her thoughts. But when she tried to get both Olivia and later the delivery boy to see how much she was in pain, her powers got out of control and had ended up killing her only chances at escaping her family. And so Olivia did come to believe that she was devil. However, Sam had talked to her and had tried to show that she wasn’t evil. Sam had explained that he had powers once and that he hadn’t been evil or the devil. So he had found a way to reach Magda and he would have found to help her if her mother hadn’t showed up. Mrs. Peterson had said that it was dinnertime and so she brought up bother of her prisoners to eat. Only there had been something wrong with the food. Magda’s mother had thought that it was time for all of them to go to heaven together and so she had poisoned the meal. And had still demanded that her kids eat after they saw their father die. Only Sam had been at the dinner table and he had gotten Magda’s brother Elijah to resist his mother. So Mrs. Peterson had just stabbed him and she would have stabbed Magda too if Magda hadn’t used her powers. Magda had used her powers to stop her mother and by time Dean had showed up – everything had been in order. Magda’s mother was arrested and Beth had found an aunt that could take her. And so Magda thought that she was finally going to get a loving home yet a mysterious stranger showed up and assassinated her before she could see her aunt. The stranger was Mr. Kertch and he claimed that he was cleaning up after the Winchesters!